Grass and hay are essential ingredients to your guinea pigs diet as hay provides much needed nutrients to ensure your guinea pig has a healthy digestive system. You should aim to have an unlimited supply of hay for your guinea pigs as they love to much and play in it all day long. Guinea pigs who have access to unlimited hay can lead healthier and happier lives. Grass hay is an essential part of your guinea pigs diet. Supplying your guinea pig with unlimited sources of fresh hay is very beneficial for your guinea pigs overall health and well being, as it contains important minerals to support their digestive system and mental stimulation. You should distribute the hay in a hay sack or rack, as well as in large piles in their cage. Guinea pigs not only eat hay, but will also nest, play and sleep in it. As well as hay being an essential part of your guinea pigs diet, you can also be fed and will love fresh grass. 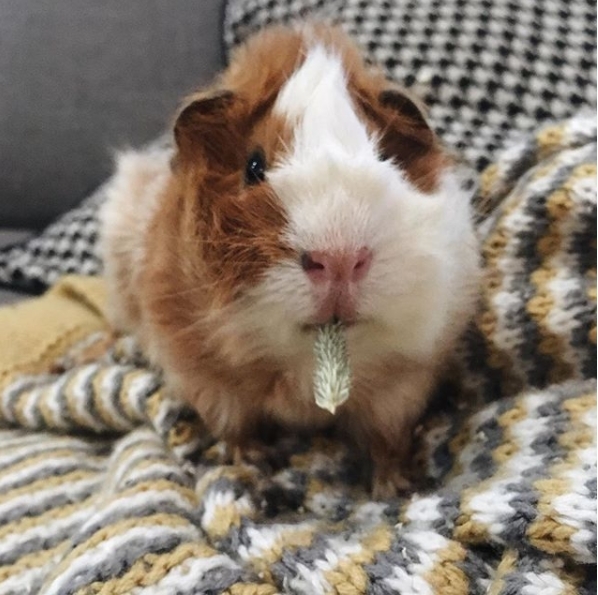 Much like hay, grass contains several important vitamins and minerals which are beneficial to your guinea pigs health and well being and can be fed to your guinea pig in unlimited amounts. You can pick bundles of grass from your yard to supply your guinea pig, or you can introduce your guinea pig to outdoor time – just be sure they are in a shady position, with access to fresh water and are always supervised. 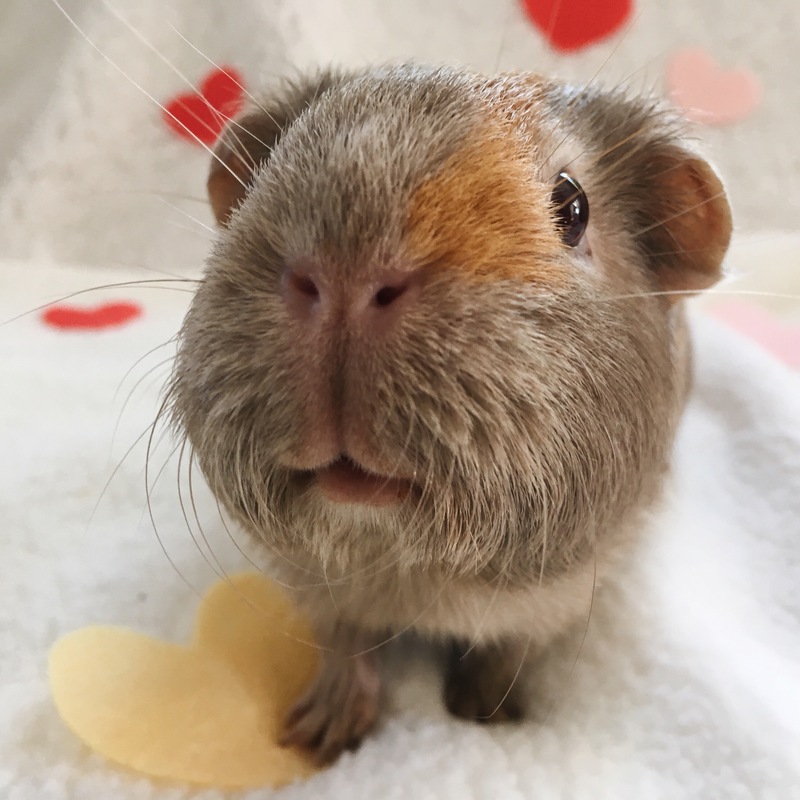 Maintaining proper teeth length is vital to your guinea pigs health as unlike humans or dogs, guinea pigs teeth are constantly growing. Without access to proper toys and food, their teeth can overgrow which can be very painful and even prevent your guinea pig from eating. Supplying unlimited access to hay will ensure your guinea pigs teeth are property maintained, though it is still important to check your guinea pigs front teeth for any chips or heath concerns. 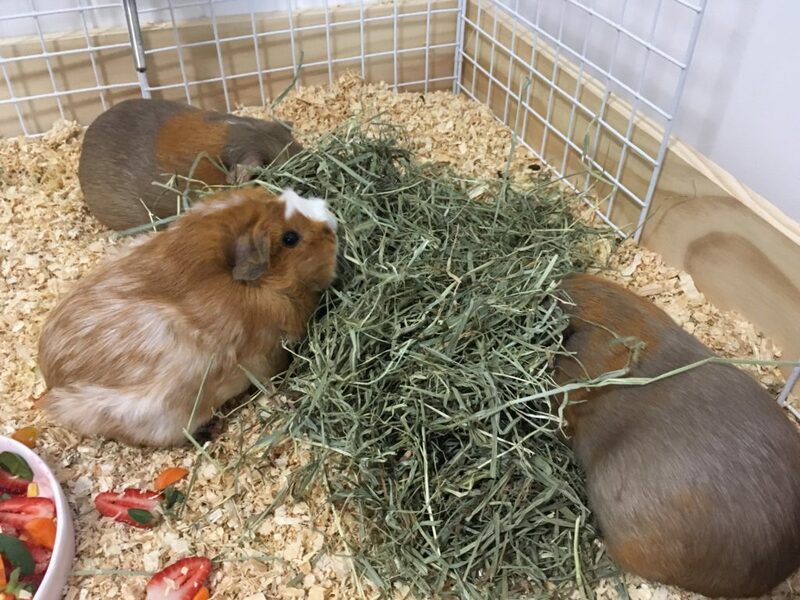 While there is an abundance of hay on the market, each hay type varies in nutrition and fiber levels so it’s important to know which hay is best for your guinea pig. Grass hay comes in a variety of different cuttings and types, with each kind being best suited for different stages of your guinea pigs development. Oat Hay: Thick, crunchy steams that are rich in fiber which is great for your guinea pigs digestive health. Orchard Grass Hay: Sweet, soft and high in fiber, your guinea pig will love munching and playing in this hay which is why it’s great for both bedding and feeding. Botanical Hay: A mixture of fibrous grass hay and dried herbs and plants, typically blended with chamomile, lemon balm and clover. Timothy hay is a great choice when selecting hay for your guinea pig. It is high in fiber, low in protein and the course stems are ideal for maintaining your guinea pigs teeth length, preventing them from growing too long. Timothy hay is widely available and can be given to your guinea pig throughout all stages of their lives in unlimited amounts which makes it the perfect everyday hay to feed your pet. There are three types of cuttings of Timothy hay, which each cut varying in texture and nutritional content. First Cutting: The highest in fiber and has an abundance of seed heads which guinea pigs love however, some stems may be too course for your guinea pig to chew and will be left uneaten. Second Cutting: Not as course as the first cutting yet still contains the necessary amount of fiber needed. The texture of the hay is thin and soft which your guinea pig will love, but still course enough to maintain their teeth length. Third Cutting: Has a higher leaf to stem ratio with few seed heads. While your guinea pig will love the texture of this hay, this cutting is lower in fiber but higher in protein and is best to be fed sparingly. The second and first cuttings are the most suitable and readily available cuts for your guinea pig. Alfalfa hay, also known as Lucerne hay, is a type of legume hay which is much higher in protein, carbohydrates and calcium and is best for young guinea pigs under six months and pregnant or nursing sows. Since alfalfa hay is a calcium rich hay, it should not be fed to adult guinea pigs as excessive amounts of calcium in their diet can cause health issues such as bladder stones which can be painful and even fatal. Your guinea pig should get enough calcium from their fresh vegetables and pellets. Be sure your guinea pig has access to hay at all times. There are many places where you can buy hay for your guinea pig, both online and local. You can find a list of shops that sell hay and timothy hay here.